Find out more about the members of Sheean Prash. Helen was born and educated in the Isle of Man, and started off her musical life in Onchan Silver Band and the Manx Youth Orchestra. She went on to become principal trumpet of the MYO touring Israel and Russia with them. Under the Manx Youth Orchestra’s Umbrella; Helen also performed with the Manx Youth Wind Orchestra with whom she toured Germany twice. 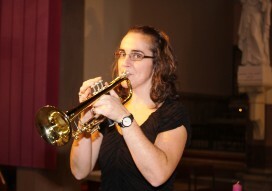 Helen has also performed with the former Manx Sinfonia (now IOMSO) and was selected to play trumpet with the Manx Philharmonic Orchestra performing many large scale works including Carl Orff’s Carmina Burana. Helen also performed in the orchestra for King William’s College’s 1991 production of Guys and Dolls and as part of a brass ensemble that gave a performance of John Rutter's Gloria along with the joint forces of the Manx Youth Choir, Manx Girls Choir and Manx Teacher's Choir under the baton of the late Alan Pickard. Having lived in several locations, music has enabled her to quickly become part of the community and make friends such as with the Harmonie des Chaprais, Bescancon, France and the Stedfast Band in Dublin, Ireland. Upon moving to New Zealand she enjoyed the high standard of Brass Banding there; having played repiano and solo cornet with Trust Porirua City Brass for five years, achieving a number of contesting successes at both local and national levels. Since returning to the Island in 2007, Helen has joined the Isle of Man Wind Orchestra and became a member of Sheean Prash in August 2010. She is a stay at home Mum to son Aran, aged four. Check out Helen's newly formed quintet on facebook at: https://www.facebook.com/quintessentialbrass/ We are delighted that Helen continues to play with the quintet on her occasional trips back to the Island. Coming from a musical family, Julie initially began playing with Murravian Brass (now Manx Youth Band) before joining her parents at Douglas Town Band, where she has now been a member for almost 25 years, performing in various roles including Flugel horn and Principal cornet and more recently has been actively involved in the coaching of young brass players. Julie also enjoys playing trumpet with Baron Otto's Bavarian Oompah Band at many charity and private functions around the Island. In 2008 she was delighted to make her first venture into the orchestra pit at the Gaiety Theatre, playing trumpet for the Manx Operatic Society's production of Disco Inferno. Outside of banding, Julie is an English and Sports Science graduate from Loughborough University and an ex-international athlete. Married to Adrian, she is a full-time Mum to their three children, all of whom including Adrian are learning to play brass instruments with Douglas Town Band. Christopher has been playing the French horn in orchestras, bands and ensembles for thirty-five years. Since moving to the Island in 2007 to work for Manx National Heritage, he has been a dedicated member of the French horn section of the Isle of Man Symphony Orchestra and completed two years on their organising committee. He has also performed in the orchestra pit at the Gaiety Theatre for shows such as The Sound of Music and Phantom of the Opera. An art restorer by profession, he lived and worked in France and Italy before returning to London to teach conservation. Chris is also a keen singer; for five years he was a member of the BBC Symphony Chorus, performing every year at the BBC Proms and making numerous broadcasts and recordings. Juan was born and educated on the Isle of Man and went on to study at Salford University, graduating with a BA (Hons) in Band Musicianship in 2000. During his time at Salford he successfully gained a university diploma and performed with all of the university's four main ensembles, with whom he toured several locations - most notably Brazil. He has also recorded a number of CDs, made several radio broadcasts for the BBC and gave a number of world premières. Furthermore Juan performed in the orchestra for many of the university’s theatre company productions. Another highlight of his time at Salford was taking part in trombone masterclasses given by both Denis Wick and Chris Houlding. Within his university studies he read various subjects including brass band scoring and arranging with Professor Peter Graham, performance with Andrew Berryman and Professor David King, as well as arts administration with Concert Manager Duncan Winfield; opting to major in all these areas for his degree. This culminated in him giving public recitals, presenting a portfolio of his brass compositions and arrangements and working as an Administrator for the National Association of Brass Band Conductors Annual Convention 2000 in Wigan. He has also worked in association with Yamaha and the charity Action Research to promote a Youth Music Entertainment Competition and gave instrumental demonstrations to encourage young people to learn a brass instrument. He was subsequently selected to attend a placement at Manchester's European Opera offices, which gave him an insight into the workings of an opera company. Outside of the university he has performed with a wide variety of ensembles including the Hawk Green Marple Band, United Co-op Milnrow Band (both as solo trombonist) and the Blazevich Trombone Quartet. He has occasionally deputised for a number of groups including: Glossop Old, Stalybridge Old and Wingate brass bands and the Salford Symphony Orchestra. Along with his experience as a performer, he has coached young brass players from the Cheshire Youth Brass Band and Rochdale Youth Big Band. Juan returned to the Isle of Man in July 2001, having done some varied freelance work as a musician and working as a Residential Social Worker in the UK. Since his return, he has devoted a great deal of time to music on the Island performing with Rushen Silver Band and the Isle of Man Symphony Orchestra with whom he gave the Island premiere of the Albrechtsberger Alto Trombone Concerto in July 2012. A regular competitor in the Manx Music Festival he has won the George Ridgeway Trophy for the best brass soloist (2002) and the open brass solo class in 2016. As a conductor he has directed several ensembles to success in 2014, 2015 and 2016. He was appointed the conductor of the Onchan Silver Band in 2002 and completed three successful years with the band. In 2009 he gained a Certificate of Teaching from the Associated Board of the Royal Schools of Music (ABRSM). He followed this up with a Certificate in Education which he completed through the Isle of Man College and Chester University in July 2015 which he completed through the Isle of Man College and Chester University in July 2015. Later in April 2016 he achieved Qualified Teacher & Learning Skills (QTLS) Status and became an Associate of the Society for Education and Training. 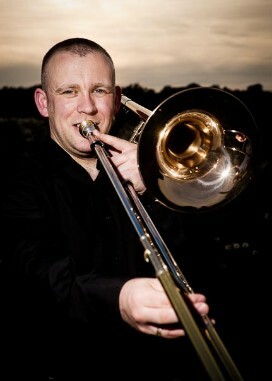 He now works for the DEC Music Service as a brass teacher and directs the Manx Youth Orchestra's Concert band. He also continues to teach a limited number of brass students privately. Prior to this he worked in several of the Island’s secondary schools and taught brass at both the Buchan School and King William's College; Outside of education he completed a year at the Erin Arts Centre as Manager, also administrating for the Latour de France Festival, in the South of France, the Mananan Festival of Music and the Arts and the Isle of Man Arts Council Guitar Festival both held in Port Erin. During his time at the EAC he formed a brass quintet attracting several eminent musicians including: Gordon Higginbottom, Raymond Leppard, Howard Snell and Roger Steptoe to each write works for this ensemble, dedicated to him. Grant was educated at Onchan Primary School and St. Ninian’s High School. 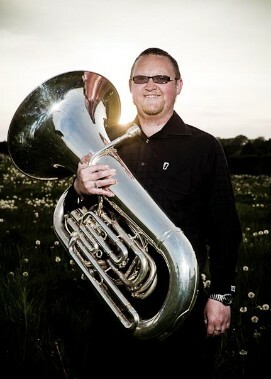 He is a founder member of Sheean Prash who toured the South of France in 2005 and is regarded by many as one of the leading Eb Tuba and BBb Bass players on the Island. For many years he was the backbone of the Onchan Silver Band as their long serving BBb Bass player, Press Officer, Secretary and their Deputy Conductor! He has also played with the Manx Youth Orchestra and as a former member of the Isle of Man Wind Orchestra has toured Belgium, Germany and the Netherlands. He now performs with the Ramsey Town Band, which has included him directing the music for their 2006 band Pantomime, Beauty and the Beast and attending the National Brass Band Championships with the band annually. Away from music Grant is actively involved in the transport movement on the island, being a Station Master on the Isle of Man Railway at Castletown, a director of the volunteer owned and operated Groudle Glen Railway, and a leading light of the Isle of Man Steam Railway Supporters’ Association as a director, webmaster and editor of Manx Steam Railway News among other activities.